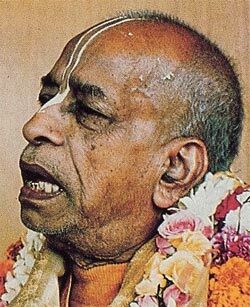 The following conversation between His Divine Grace A.C. Bhaktivedanta Swami Prabhupada and an Indian doctor took place in September 1973 at the Hare Krishna center in London. Srila Prabhupada: No, it is a scientific fact. Our science is perfect, because we are receiving knowledge from the perfect source, Krishna. And modern so-called science is imperfect, because the scientists’ knowledge is received from imperfect sources. However great a scientist you may be, you have to admit that your senses are imperfect. Srila Prabhupada: So, imperfect senses can give only imperfect knowledge. What you are calling scientific knowledge is bogus, because the men who have produced that knowledge are imperfect. How can you expect perfect knowledge from an imperfect person? Doctor: It’s a question of degree. Srila Prabhupada: My point is that if you are unable to give perfect knowledge, what is the use of taking knowledge from you? Doctor: Yes, I accept that view. But how do you prove that the soul exists? Srila Prabhupada: You take information from the perfect source, Krishna, or from Krishna’s representative, who repeats the words of Krishna. That is our process of proof. Evam parampara-praptam: “Transcendental knowledge must be received in disciplic succession.” We don’t accept knowledge from a rascal; we accept knowledge from Krishna, the Supreme. I may be a rascal, but because I am receiving knowledge from the perfect source and repeating that, whatever I say is perfect. A child may be ignorant—he does not know what is what—but because he has learned that a certain article is called “table,” when he says “Father, this is a table,” his words are perfect. Similarly, if you hear from the perfect person and believe that, then your knowledge is perfect. Krishna says tatha dehantara- praptih: “After death the spirit soul enters another material body.” We accept it. We don’t require proof from a so-called scientist, who’s imperfect. Doctor: So the question of belief comes first. Srila Prabhupada: It is not belief; it is fact. Doctor: Yes, but how do you prove that fact? Srila Prabhupada: That Krishna says so is proof. Srila Prabhupada: That is our Vedic proof. Whenever we say something, we immediately quote from the Vedic literature to support it. This is our process of proof, which is just like that in the law court. When a lawyer is arguing in court, he must quote from previous judgments. Then his argument will be accepted by the judge as legal proof. Similarly, as soon as we say something, we immediately support it by quoting from the Vedic literature. That is the way of proof in spiritual matters. Otherwise, what are the scriptures for? If they are merely products of mental speculation, what is the use of these books? “The soul is changing his body from childhood to youth and from youth to old age. Similarly, the soul enters another body at death.” Where is the illogical presentation? This is scientific. For an intelligent man, this is scientific proof. And if he’s still dull-headed, what can be done? Doctor: But the soul is invisible. How can you be so sure it exists? Srila Prabhupada: Just because something is invisible doesn’t mean we can’t know it exists. The subtle body of mind, intelligence, and ego is also invisible to you, but you know that the subtle body is there. We have two kinds of bodies: a gross body of earth, water, fire, air, and ether, and a subtle body of mind, intelligence, and ego. You can see the body of earth, water, and so on, but can you see the subtle body? Can you see the mind? Can you see the intelligence? Yet everyone knows you have a mind and I have a mind. Doctor: These are something abstract, you know. Srila Prabhupada: No, not abstract. They are subtle matter, that’s all. You simply have no eyes to see them. Srila Prabhupada: Anyway, you accept that the subtle body exists even though you cannot see it. That is my point. Similarly, the soul exists even though you cannot see it. The soul is covered by the subtle and the gross bodies. What is known as death is the annihilation of the gross body. The subtle body remains and carries the soul to a place where he can again grow another material body just suitable for fulfilling the desires of his mind. English guest: You mean the subtle body and the soul are the same thing? First of all, in the gross understanding, we are aware of only the senses of the body. Those who are like animals think that the senses are all in all. They do not understand that the senses are controlled by the mind. If one’s mind is distorted, then his senses cannot work; he is a madman. So the controller of the senses is the mind. And above the mind is the intelligence. And above the intelligence is the soul. We cannot see even the mind and intelligence, so how can we see the soul? But the soul has his existence, his magnitude. And if one has no understanding of the spirit soul, he is no better than an animal, because he is identifying himself with his gross and subtle bodies.